Harrington Hall, with its private parking, provides the perfect location for any holiday or business traveller. Enjoy the surrounding galleries, museums, Cathedrals, theatres, fashionable shopping streets, restaurants & pubs. Stone throw away from St. Stephen's Street. Meticulously refurbished and very recently opened (March 1998), Harrington Hall retained most of the original Georgian features. All rooms are suite and are equipped as one would expect from such a stylish . Furthermore, Harrington Hall has looked into the future and optional fax facilities and access to Internet are amongst its modern additions. You are insured of the lowest internet-rates. But you can pay at the reception of Harrington Hall, Dublin 2. Without reservation costs and at the lowest price! After your reservation you receive a conformation by e-mail. 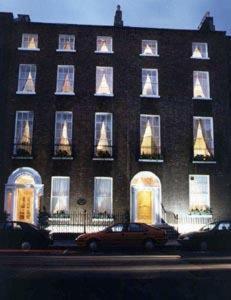 We wish you a pleasant stay at our hotel in Dublin 2.